Steve On Broadway (SOB): Strictly Ballroom Musical? Hard to believe it's already been 18 long years since "Strictly Ballroom" -- the first film from director Baz Luhrmann's "Red Curtain Trilogy" -- initially took the world by storm. Yesterday came news that the stylishly inventive Australian auteur has his eyes set on bringing that cult film to the stage via a new musical. 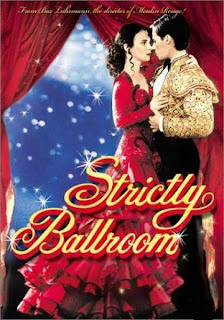 Through "Strictly Ballroom," Luhrmann may have singlehandedly reinvigorated a flagging dance genre, well over a decade before the likes of "Dancing With The Stars" and Broadway's Burn The Floor. Credit Baz Luhrmann with the spellbinding genius for making one of the most enduring of operas into an accessible and excellent theatrical event. Not since Dorothy landed in Oz have I witnessed as glorious a transformation from black and white to full blown color as I did during this amazing production. In this case, it occurred when love was in full bloom. I only hope that Luhrmann won’t stay away from Broadway too much longer. Since the creative workshops set for Sydney are still a few months away, audiences won't see Strictly Ballroom - The Musical anytime soon. And as shows like Priscilla Queen Of The Desert have demontrated, it can take years for a show to wind its way from Australia to Broadway. But strictly between you and me, with Luhrmann at the helm, I have little doubt that it will be worth the wait. I agree that Luhrmann has a unique approach and Broadway would certainly be invigorated with his eclectic energy and imagination. I look forward to this production and hope that it doesn't take years to get here!